Eating for Your Blood Type to Lose Weight: Which of the 4 Individualized Blood Type Diets is for You? The benefits of eating for your blood type are clear: boost your energy, eliminate food intolerances that lead to bloating, weight gain and more. That’s the basis of the massive hit Eat Right for Your Type by Peter D’Adamo, a Doctor of Naturopathy specialized in the 4 blood type diets. And despite its critics, the results of countless people who have used it successfully speak for themselves. Believe it or not, the concept of eating according to your blood type has a strong scientific basis over decades of scientific study and practical experimentation. It is founded on the well-known theory of the humans’ blood types evolution since the dawn of humanity. Why is Eat Right 4 Your Type such a hit? 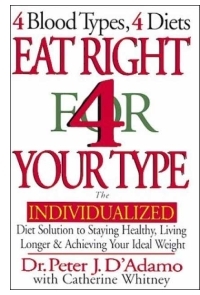 Well, because since publication in 2002, Dr. D’Adamo’s book Eat Right 4 Your Type: The Individualized Diet Solution to Staying Healthy, Living Longer & Achieving Your Ideal Weight got incredible popularity. That’s because countless people finally found a practical solution to their long-fought with weight problem. In a nutshell, the 4 blood type diets are based on scientists’ findings according to which the antigens in your particular blood type react differently with specific lectins in various foods. Often times, these lectins even create a toxic chemistry in your body – leading to common health issues, including weight gain. Your particular blood type is expressed in all of your body’s cells. Believe it or not, it’s been known by scientists for years that you have a bigger risk for some diseases and a lower risk for others, depending on your specific blood type. Have you ever wondered why is it that diets work differently for different people? For example, you might thrive on a vegetarian diet, while your friend might not be able to go 2 days in a row with no meat without feeling short-tempered and moody, right? Or, why you lose weight easier on a high-carb, low-fat diet while someone else is better off on a high-protein, low-carb diet. Because you are not the same with anyone else and your blood type largely influences your physiology and metabolism – “Eat Right for Your Type” provides a solid, detailed explanation. But it gets even better. Dr. D’Adamo demonstrates that eating for your blood type according to the 4 blood type diets is not only for people who want to lose weight, like you – the weight loss is only a natural consequence of eating right for your blood type. So if you still think that the blood type diets are ridiculous, just look into the scientific evidence cited in Dr. D’Adamo’s “Eat Right for Your Type” book, and decide for yourself. Even better, try your specific diet for a couple of weeks – you may just find that eating for your blood type is one of the most holistic, safe, natural and enjoyable ways to lose weight and keep it off. So, if besides losing weight you want to boost your energy level, improve your moods and reduce – or even heal – chronic illnesses, you must give a try to eating for your blood type. Obviously, you must know your blood type first and foremost. If you don’t already, you can use a blood type testing kit – they are readily available.